Welcome to the last issue of Carol's Corner for the year 2105. Are you all ready to begin anew in 2016? This picture was taken at the Mall in Ithaca when I was there to see a movie last week, well actually I went to see a movie twice last week. 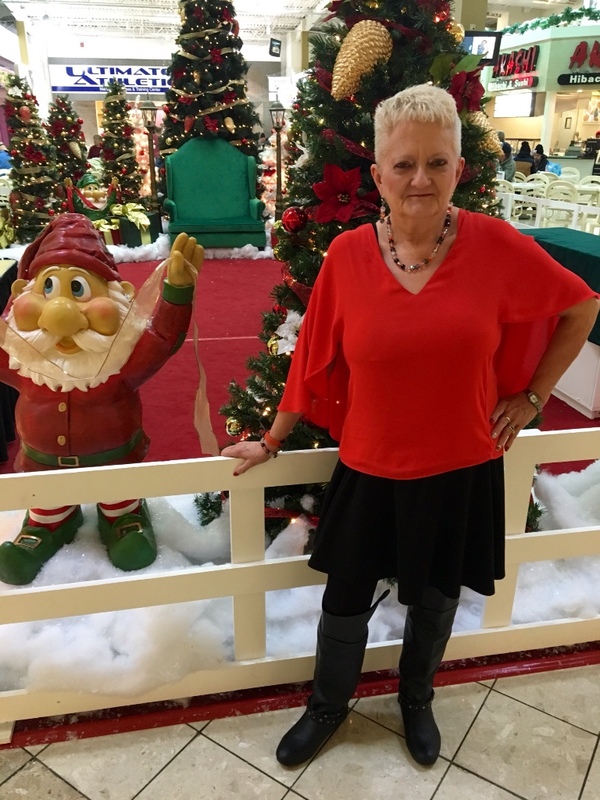 This ensemble was dubbed 'Santa's Helper' by Stacey Shotko. I adore this top and have paired it with many pieces since I purchased it last year. 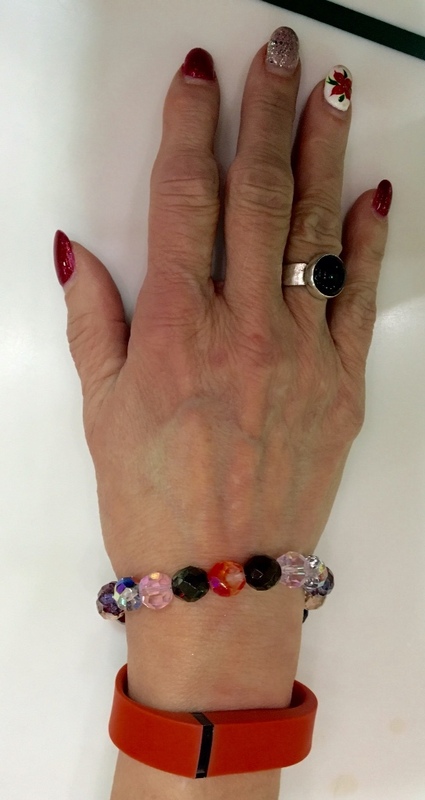 The jewelry I wore with this is a set I made and has a lot of different shades of color in it that blends nicely with the top. 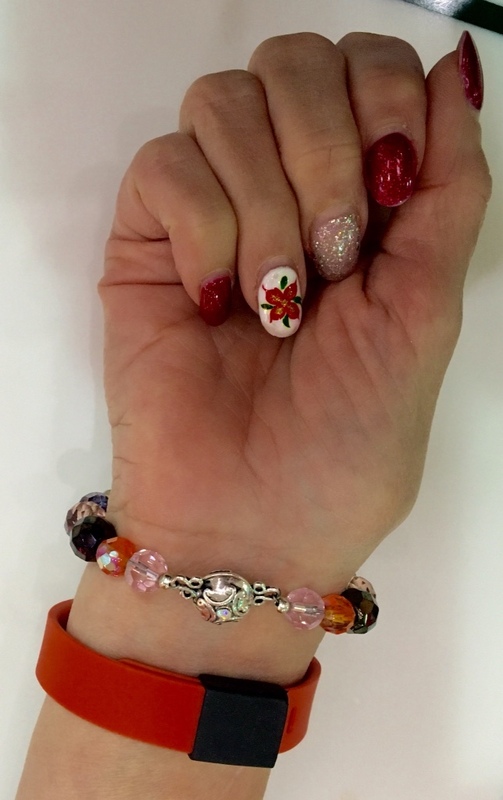 The FitBit band is in between an orange and a red. It photographed a bit darker shade than it really is. I never wear my FitBit bands without a clasp cover. It is a necessity to ensure you don't lose your FitBit if it accidentally comes apart. I have different sizes and many color's so I can come up with many combinations to coordinate with whatever a I am wearing that day. This won't be a long blog post but wanted to fit in something before New Years. Tomorrow I will be having a great evening dressing up, eating too much and dancing the night away. Stay tuned for my next post which will feature my New Year's Eve ensemble. I might be taking a few days rest before my next blog entry. So for this post I thought I would give you a review of my newest workout which arrived today. 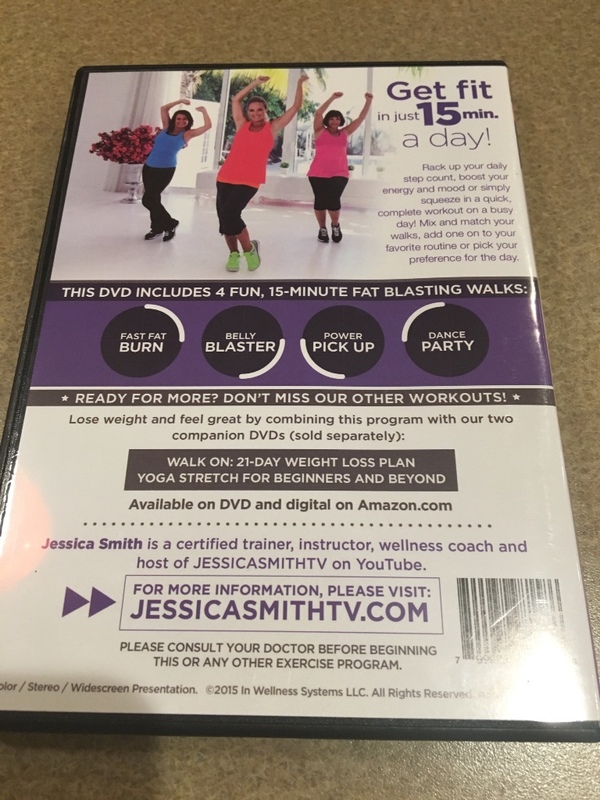 This is the second Jessica Smith walking workout that I purchased in the last week. This is from her 'Walk On' series named '15 Minute Fast Fat Blasts'. It consists of 4 separate 15 minute walks. This shows the back of the DVD case. She does all of her walks with her mom Debbie and one of Jessica's friends. Her mom does all of the lower intensity moves and her friend does more advanced moves, so at any point you can choose how you want to perform the moves. I did all four workouts today for a total of 60 minutes. And boy,was I sweating by the end and I don't always sweat during my workouts! These are the four walks. 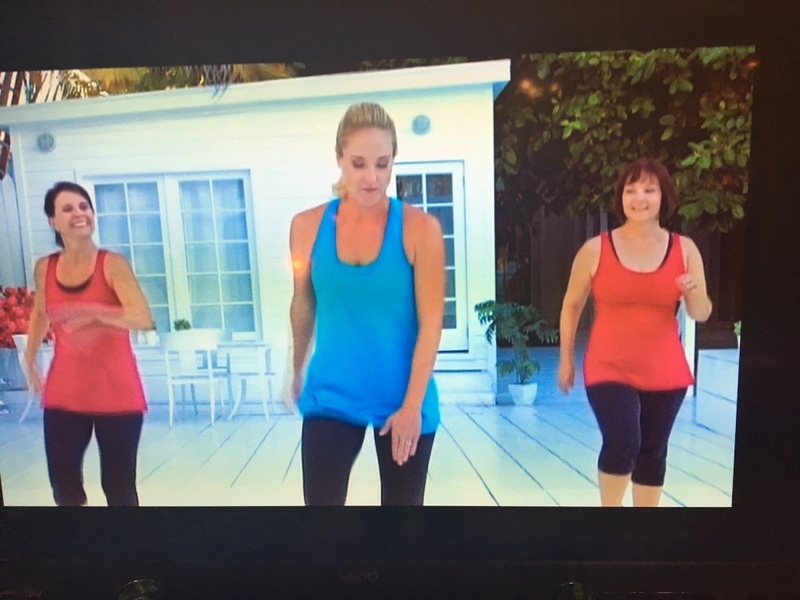 First up is the Fast Fat Burn, second is the Belly Blaster, then we move to the Power Pick and finally we have Dance Party. You can mix and match any of these to fit into your day or you can do all four to make a sixty minute workout. Believe me if you do all four you are going to get a really great workout. She has lots of interesting moves and combos, some of which will make you think as you go through them. When I can't catch a move right away, I just wing it and keep on moving. While I was working out to this I snapped this picture on my tv. The pic came out pretty good. Some of the workouts were done indoors some out,like this one. Her Mom Debbie is on the right and her friend on the left (that is looking at this straight on). I would love to know where they got these workout tops because I would love both of them. The red ones are split on the bottom of each side and the bottom of Jessica's, blouses on the bottom. These both would be great tops for summer as well as workout attire. If you are looking for some different and challenging workouts to add to your collection, I strongly recommend trying some of Jessica's. I think it pays to mix up your workouts so your body isn't used to the same thing all the time. Today I did all of this one and after, I did Miles 4 & 5 of Leslie Sansone's 5 Boosted Miles which brought me to a total of an hour and a half of workouts for the day. Not bad for a day's work. When I feel I can spend a little more I am going to purchase her 'Walk On: 21-Day Weight Loss Plan'. That one is a little more costly at $29.99 and has 4 DVD's. I first have to pay my next month's Amazon bill before I dare make another purchase. I have another Sansone set coming next week and I'll share that with you when I receive it and do all the workouts that it includes. Variety in workout choices is what helps me stick to a regular regimen of exercise, so every penny I spend on them is well worth it. If someone had said to me that I would ever be an exercise fanatic , I would have told them they were dreaming. But lo and behold here I am, not even taking a rest day unless I am sick and even then it bothers me that I can't workout. Exercise is key to so many health issues. Make it part of every day in some way. You won't be sorry you did. As 2015 draws to a close let's think all all the ways we can continue to stay on our journey in the year ahead. It would really be helpful to me if any of you who read my blogs on a regular basis would let me know if they have been helpful to you and if there is anything you need addressed or need information about. I do this to help each of you in any way that I can. This is what I consider my ministry for as long as I am blessed to live and believe me I know I am blessed to be alive. By the grace of God I am still among you. I am not sure of all the reasons my life was spared in my recent accident, but I think what I do here and in my groups might be one of those reasons. Whatever they may be I know that God isn't finished with me yet. I hope I can continue to inspire, motivate and educate to the best of my ability in the coming year. Have a great day tomorrow and see you in the New Year. Till then,God Bless.